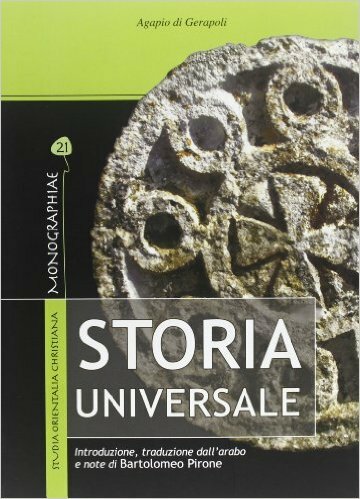 Bartolomeo Pirone, Agapio di Gerapoli: Storia universale, Edizioni Terra Santa (2013), series: Monographiae vol. 21. Links: Amazon.com, Amazon.co.uk, and the Italian site of the publishers. The ISBN is 978-88-6240-164-7, it is 494 pages long, and available for around $50, which is quite a lot. For anyone interested in Arabic Christian studies who knows Italian, this is probably a must-buy. The histories that a language group write about themselves are always the first items to read. It is now a few years since I converted the old French translation of Agapius into English, and placed it online. The second half of the work exists in only a single, water-damaged manuscript in Florence, Ms. Laurenziana Or. 323. A few years ago Robert Hoyland went to look at the manuscript, and discovered that it had been conserved, and two pages, previously stuck together, were now readable! He published them with an English translation; and has now uploaded that to Academia.edu here. Which is rather marvellous, really! Very interesting, thank you – especially about the Robert Hoyland work online, and your own English translation (of which I was somehow unaware until now)! You’re welcome, but I owe all this to Italian commenter Ezio. Roger, thank you so much for the kind acknowledgement! I forgot to mention that Pirone has also released a translation of Yaḥyā ibn Saʻīd al-Anṭākī. Unfortunately the book is out of print but it seems there are three copies available in English libraries. the other one whose name you can never remember, Ibn al-Rāhib. As far as I know the last two remain unedited and untranslated in a Western language. I know you abandoned your Al-Makin transcription project in March of last year but, if you permit, I’d like to share some materials with other researchers still interested in the matter. The first three are simple reproductions of Erpenius’ edition. and it seems the scans are good enough to be readable even for non-Arabic speakers like me. To conclude, I found a bibliographic record of a possible abridged edition of Al-Makin : http://id.sbn.it/bid/RMS2748779. Thank you very much indeed – this is fascinating! It is great to see that a manuscript of the first half has come online! This I did not know – thank you. I did abandon the al-Makin project. It proved unfortunately impossible for a non-Arabic speaker like myself to make happen. But as you say, someone may find these very useful. I wanna share some good news with those interested in Al-Makin. In Ethiopian chronicles Al-Makin is known as Giyorgis Wäldä-Amid (George, son of Amid) while Tarikä Wäldä-‘Amid (Chronicle of Wäldä-Amid) is the title given to his “Blessed Collection”. Haylu was an Ethiopian prince in the 18th century, nephew of https://en.wikipedia.org/wiki/Mentewab. Professor Sirgiw Gelaw from Addis Ababa University (http://www.aau.edu.et/aelc/centers/philology-center/staffs/sirgiw-gelaw/) has prepared an Amharic translation from Ge’ez of Al-Makin, the manuscript is 560 pages long and is still waiting publication. About manuscripts, according to the “Catalogue raisonné de manuscrits éthiopiens appartenant à Antoine d’Abbadie”, available here http://gallica.bnf.fr/ark:/12148/bpt6k1044499, the Bibliothèque Nationale de France in Paris has an Ethiopian version of Al-Makin, transcripted in Ge’ez at the end of the 17th century and covering the first part of the work.. Thank you very much for this. I will turn this into a blog post, if you don’t mind? Roger, it’s a real pleasure and an honor to share this infos with those interested, you have my blessing to use my comments as you see fit, just credit me as the source and you’re good to go. Glad to do so! But … I don’t actually know your name. Is “Ezio” enough? Roger, I just returned from a wedding where I was the best man and I find that you put up an entire post on my findings about the Meta Sudans! I feel both proud and embarrassed,anyway from now on while commenting I will use my full name so that if in the future I can contribute anything useful you can credit me properly. I’m a simple guy that loves to do researches and share what I find with those interested, at the same time I believe that in scholarly matters it’s essential to give our sources as references so that anyone can check out the truthfulness of what we wrote. Thank you so much – I will. But … with your interests, have you considered starting a blog yourself? Roger, you’re not the first to suggest me to start my own blog. If my current situation was different I would do it in a heartbeat. Sadly, I’m a long-term unemployed thirtysomething with only a senior high school degree, most of the time I’m hunting for a job, add to it I’m not very good at managing my spare time and you can see that the idea of setting up a blog becomes an impossible dream. If I lived in another country I would have the chance to make blogging my full-time job and maybe earn a living but unfortunately I live in Italy. In my country pretty much all activities pertaining to the Web are treated like useless garbage and those who try to be professional bloggers are pointed at like social pariahs. Let’s say I will start a blog when Italian society will show respect to individuals independently from their jobs. Anyway, thank you so much for your supportive stance. I don’t think that there are many professional bloggers anywhere, even in the USA. I do my blogging as a hobby, in spare moments of time, and every blogger that I know does the same. Sadly I think that working freelance, and hunting for work, is what we all have to do – the old-style jobs-for-life are gone. Interesting that Italian society is so dismissive of the web, tho. How foolish. The Germans, of course, are REALLY stupid about the web. I think I have to expand some parts of my last comment. As an Italian citizen, I can tell from direct acquaintance that my country is the land of paradoxes: we have a treasure trove of artistic and historical heritage but we are unable to preserve it properly and promote it as an economic resource. For me it’s a maddening and idiotic attitude. For example the recent restoration of the Colosseum has been possible only thanks to private funding (http://www.curbed.com/2016/7/5/12093372/colosseum-restoration-rome-italy-tods).I’m ashamed that to preserve the past of our civilization we have to hope for the generosity of philanthropist corporate managers while our governments sleep quietly. Italy has a population of 60 millions, there are 100 millions of smartphones and tablets in their hands but the vast majority uses their devices only for social networking. This means Italians are digital analphabets and they can’t use a personal computer because they miss the proper knowledge (youths under 25 have a short attention span and people over 60 are too old or lazy to learn). People that have certifications in information technologies find stable jobs only with big enterprises because the little ones will ask you to work for free and to justify themselves will tell you “Doing computer stuff is small potatoes, it’s so easy that if you don’t take this job I will give it to my preschooler son”. About the Germans, I think they aren’t stupid just dumb and greedy. On one hand we have good initiatives like the digitization project of the Bayerische Staatsbibliothek, the digital Monumenta Germanie Historica (http://www.dmgh.de/) and the support for Europeana (Germany is the second contributor country for number of digital objects with 5,5 millions on a total of 53,5). On the other hand we have the Google Books/Hathitrust situation: the Americans can access anything published before 1923 while Europeans only stuff before 1870 because greedy German publishers decided they deserved to be paid huge sums of money for giving access to books available only in libraries while they had no intention of reprinting them. Google didn’t accept their blackmail and we have to live in this disheartening situation. About professional bloggers, most of them already have a job that involves writing so the vast majority are journalists, researchers, teachers, writers and students. My humble opinion is that every activity that requires my time and my skills deserves a proper compensation. Alas, we can only dream a world like this! I certainly make sure that people who do proper work for me get paid. All we have in this life is time. We sell it for money, in order to live. To take a man’s time and not pay him is theft. (Of course hobbyists collaborate together, which is slightly different). I agree about the Germans. Apparently they’ve even got a law which makes public wifi impossible. But I fear that the German government is controlled by big business, and indifferent to the welfare of the German public. I hope that, now that Britain is leaving the EU, we will find a way to escape that wretched and greedy nonsense with Google Books. But I fear that nobody in the UK or EU knows anything about Google Books. As for Hathi, that continually annoys me. I’m sorry to hear about the situation in Italy. But as the old people die, things will change.